Del. No. of aircraft delivered. LS↓ No. of aircraft leased from another country. On Or. No. of aircraft to be delivered. LS ↑ No. of aircraft leased to another country. W/O No. of aircraft Written Off (crashed). Act. No. of aircraft operational. Report above is based on original aircraft type. 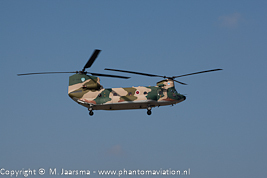 Operated the CH-47C which were withdrawn from use and seven sold to The Netherlands. Bought CH-47D's from the US Army for operations in Afghanistan before its CH-147F were delivered. In the process of receiving former US Army CH-47D's to augment is fleet of Chinooks. Requested the potential sale through FMS for five CH-47Ds which has been approved by the State Department (DSCA) on April 27th by notifying US Congress. Purchased 14 new CH-47F's with its current fleet of six aircraft to be upgraded to the same standard. 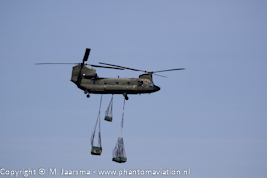 The Defense white paper (defensie nota 2018) published on March 27, 2018 states the possibly purchase of another three CH-47F's. 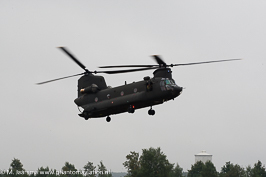 The CH-47D's will be withdrawn from use once the new Chinooks have been delivered (2020 - 2022). The contract for 14 new CH-47Fs was signed in 2015. These will be delivered to US Army CH-47F standard, the six already delivered F-models will be retrofitted. 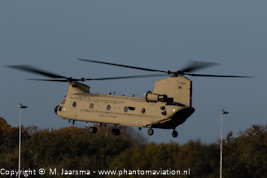 On December 14, 2017 Boeing and the Dutch MoD signed an agreement to upgrade these Chinooks to the latest variant with deliveries to begin in 2021. The CH-47C was captured from Argentina during the Falkland war - referred to as 'other delivery. It was used as a instructional airframe in the UK. Chinook HC.1 33 Chinooks based on the CH-47C. These were augmented by eight Chinooks based on the CH-47D. engines. Three new Chinook HC2s were also bought. Chinook HC.3 Eight Chinooks based on the US Army MH-47E for use by the special forces. Chinook HC.4 Retrofitted Chinook HC.2(A) receiving a new cockpit, engine upgrade & FLIR. Chinook HC.5 Upgraded Chinook HC.3 receiving a new cockpit, engine upgrade and FLIR. Chinook HC.6 14 Chinooks based on the CH-47F incorporating a new DAFCS. Chinook HC.6A Upgraded Chinook HC.4 (DAFCS and ACAS). ACAS Airborne Collision Avoidance System. DAFCS Digital Automatic Flight Control System. FLIR Forward Looking Infra Red. Details of the Royal Air Force Chinook fleet. 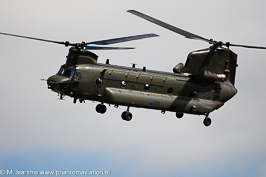 Currently the Chinook HC.4 fleet is being upgraded to HC.6A standard. On October 19, 2018 the DSCA approved the sale of 16 CH-47F's. Currently Boeing is manufacturing the CH-47F with the order by the US Army split into new build Chinooks and renewed Chinooks from CH-47D airframes. The same applied to the CH-47D model itself which were either new build helicopters or remanufactured (upgraded) earlier Chinook models. Royal Air Force Chinook HC2 US Army CH-47F.